Moderation is necessary for several reasons: content may be advertising spam, automated or not, or it may violate our guidelines on respectful interaction as laid out here and in our code of conduct. Please treat our community website and mailing lists as a place of respectful conversation and civility. These guidelines are a brief overview with some added specifics for mailing list and website norms; please read our code of conduct for a more complete description of expected respectful interaction. Subject lines are not the place for humor or euphemisms, although enthusiasm is OK. Aim for short and literal. Has a post, comment, or email of yours been put in moderation, or have you been banned and you don't think you should have been? Email the moderators group (read more below) at moderators@publiclab.org. The moderators group is a discussion list including all moderators, who are Public Lab community members, where moderation decisions can be discussed if there's uncertainty. For reasons of privacy, the moderators group archives are only readable by moderators. This ensures that the moderators can discuss questionable, private, or sensitive content to make decisions about moderation. Individual moderators may act to moderate any inappropriate content based on the content guidelines above. Any ambiguous case can be brought up by any community member by emailing the moderators group for input, including by the moderated party. The moderators group is open to anyone in our community. To join, please email moderators@publiclab.org with a link to your profile. 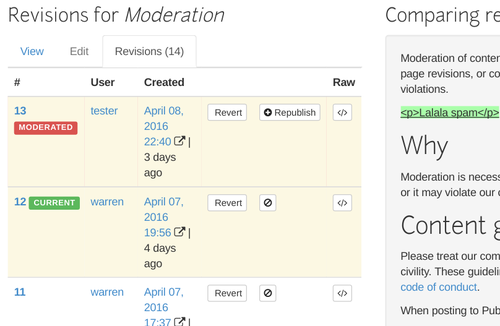 Moderation can happen through different systems in the Public Lab community. Here's a brief overview. 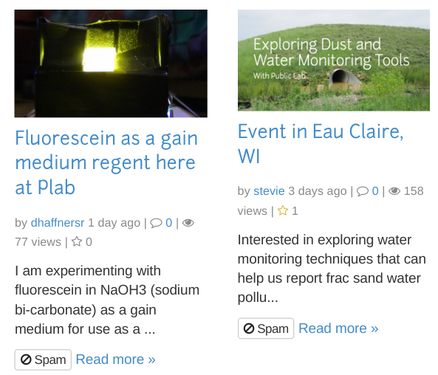 Public Lab hosts many different topical and regional discussion lists, currently using Google Groups. Moderators review the first posts of all new members before approving them to post automatically. Community members may be placed in moderation if their posting pattern changes such that it violates our content guidelines. Before being placed in moderation, a member will be notified on the relevant list. There are different moderators for each list, but the Community Development team (@liz and @stevie) are moderators on every one, and are also in the moderators group. 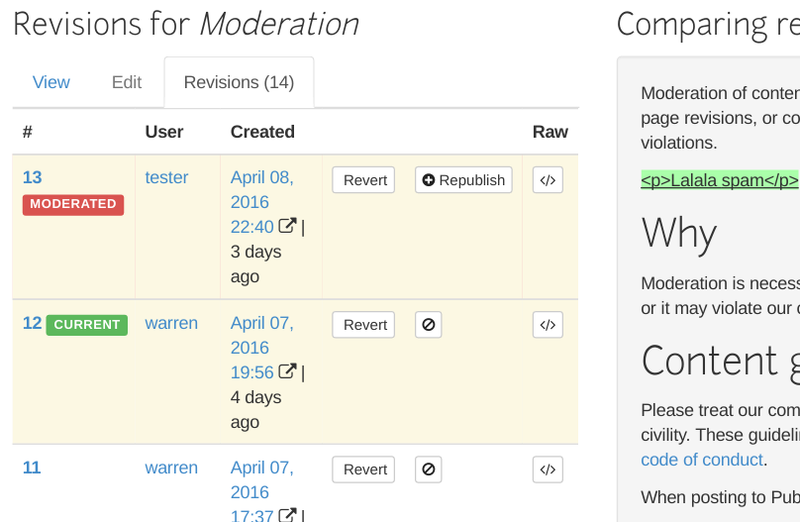 Moderators on these lists are not the same as moderators on the PublicLab.org site -- read on! 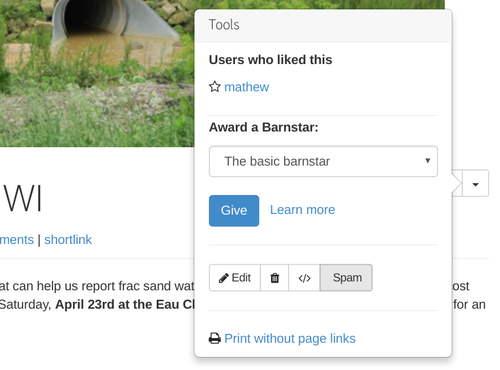 Users on PublicLab.org can be marked with the role "moderator" or "admin", which gives them the ability to ban posts and users. Other users can undo these actions. Admins can actually permanently delete content. 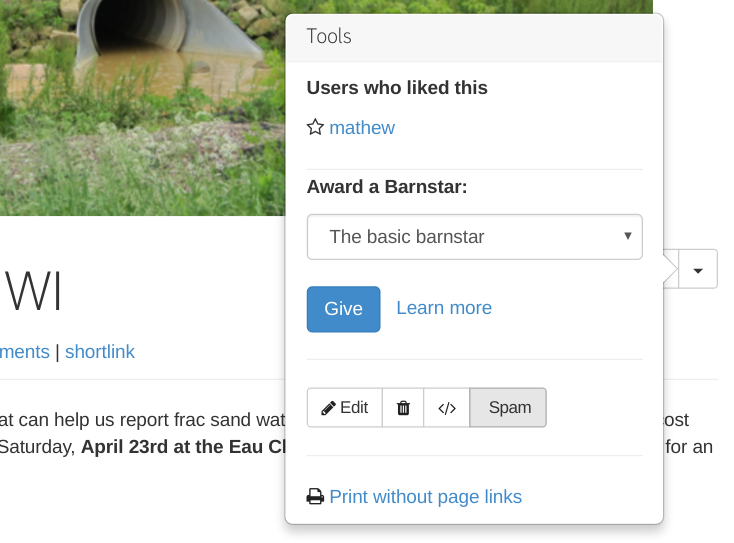 Research notes can be individually banned, which, when using the Spam buttons visible to site moderators below each post, and under the "options" dropdown next to the "liking" menu. This also bans the user and all their other posts, although this can be undone with more granularity in the spam page, visible to moderators and admins. Users whose posts are spam are themselves banned and their profiles and other comments are hidden except to moderators and admins. Moderators and admins can unban a user from their profile page. Comments can't be moderated, so they must be deleted. See feature request here for plans to fix this. As of April 2016, first-time posters on PublicLab.org are moderated by default.